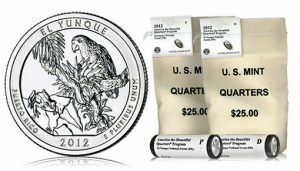 United States Mint bags and rolls of 2012 El Yunque National Forest Quarters were made available Friday, February 3. El Yunque quarters were actually released into circulation beginning on January 23. The new quarter marks the first of five releases scheduled in 2012 and the eleventh in the America the Beautiful Quarters® Program. Prices were lowered for 2012 America the Beautiful Quarter products as compared to the 2011-dated issues. Prospective buyers will see a reduction of $15 and $7 on the price of the U.S. Mint’s 100-coin bags and Two Roll Sets, illustrated in the pricing grid below. The bags and rolls contain circulating quality coins directly from the U.S. Mint facilities in Philadelphia and Denver. Each two roll set includes 40 quarters from Philadelphia and 40 quarters from Denver, totaling 80 coins. The 100-coin bags are composed of coins that are solely produced at one of those two facilities, depending on the buyer’s choice. These products come in special U.S. Mint marked packaging indicating the name of the national site and the two-letter abbreviation for the state, district, or territory in which the site is located. This release honors El Yunque National Forest in Puerto Rico (PR). The facility’s mint mark and the face value of the bags or rolls are also indicated. Some banks may already have their own supply of the El Yunque quarters at face value, since the Federal Reserve Bank issued the quarters into circulation on Monday, January 23. Their packaging is different, however, and many collectors have complained that their own local banks do not have the new releases — banks cannot order quarters by a specific design which makes finding certain ones more difficult. Also, local banks generally receive coins predominately minted in either Denver or Philadelphia, not from both facilities. As seen in early December when the U.S. Mint unveiled the selected five reverse designs for the 2012 America the Beautiful Quarters, the El Yunque quarter’s reverse features a Coqui tree frog as it sits on a leaf and a Puerto Rican parrot perched on an epiphyte plant. Tropical flora is in the background. The design was created by Gary Whitley and engraved by Michael Gaudioso. Inscriptions on the reverse include EL YUNQUE, PUERTO RICO, 2012 and E PLURIBUS UNUM. As with each coin in the series, the El Yunque quarter has a common obverse design, which is the 1932 portrait of George Washington by John Flanagan. The United States Mint digitally restored the image to that of the original model to enhance the details and beauty of the design for the America the Beautiful Quarters series. Inscriptions on the obverse are UNITED STATES OF AMERICA, LIBERTY, IN GOD WE TRUST and QUARTER DOLLAR. Other special products with the same designs as the new quarters are the three inch, five ounce silver coins. The investment quality El Yunque 5oz Silver Bullion Coin will be offered sometime this year to the U.S. Mint’s network of Authorized Purchasers, and the collector quality El Yunque 5 oz Silver Uncirculated Coin will be sold directly to the public from the Mint. Launch dates for either coin have yet to be officially announced. 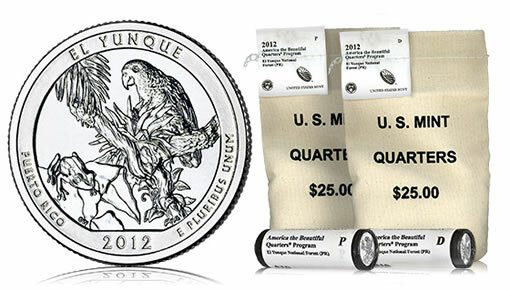 El Yunque quarter bags and rolls and related products may be purchased from the United States Mint website at http://www.usmint.gov/ or by calling the bureau’s toll free number 1-800-USA-MINT (872-6468). Fifty-six coins in all will be issued during the complete program which is slated to run until 2021. Each coin will honor a different site of national interest from around the country such as national parks, national forests, etc. One site has already been selected from each state, the District of Columbia and the five US territories. Upcoming 2012 America the Beautiful Quarters will celebrate Chaco Culture National Historical Park in New Mexico, Acadia National Park in Maine, Volcanoes National Park in Hawaii and Denali National Park in Alaska. El Yunque National Forest is the only tropical rain forest in the U.S. National Forest system. For more information about the area, visit the USDA Forest Service site for it at http://www.fs.usda.gov/elyunque/.